We have a great new product for face and body! 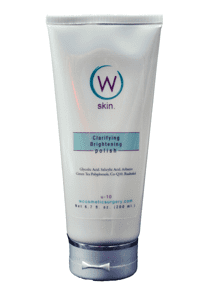 Our WSkin Clarifying Brightening Polish is a mild cleanser with exfoliating micro-beads. This is our WSkin Product of the Month! This formula has smoothing, softening, exfoliating, brightening and purifying qualities thanks to its high-performance ingredients, such as Glycolic and Salicylic Acids, Arbutin, Bisabolol, CoQ10, Green Tea Polyphenols and Vitamin C. In my experience the combination of these high powered ingredients is great for every skin type, from oily to dry. Specifically, Glycolic Acid helps slough away dead skin cells to enhance texture and moisture levels while diminishing the appearance of fine lines and wrinkles, without causing irritation. Salicylic Acid gently clears the pores of oil and improves skin’s clarity. Green Tea Polyphenols and Co-Q10 help protect the skin from free radicals and environmental damage and our stable Vitamin C helps nourish and restore moisture to the skin. Bisabolol enhances the tone of skin while radiance boosting. Arbutin helps increase skin brightness. This gentle formula thoroughly removes makeup, excess oils, grime and toxins to reveal a fresh and pure complexion. The dual action of manual and chemical exfoliation thoroughly dissolves skin cell buildup. Wonderful for face and body to give you silky smooth skin! As always, we’re here to answer any questions you may have about your skin! Gina Veith, LMEhas been a Licensed Medical Aesthetician with W Cosmetics for more than a decade. Gina guides our patients through every step of their journey as our surgical consultant and is the lead medical aesthetician at W Skin Studio. Learn more about Gina.